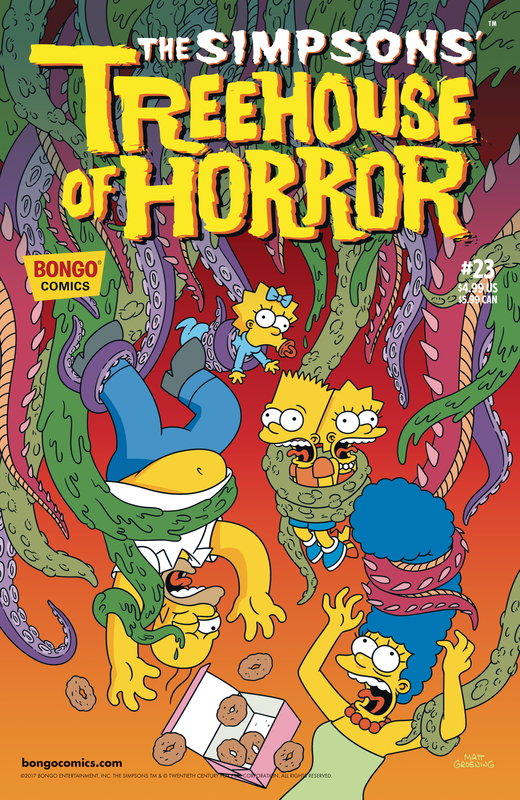 The Simpsons Treehouse of Horror #23 is the twentieth-third issue of Bart Simpson's Treehouse of Horror. It was released on September 20, 2017. "As children, Marge, Homer, Lenny, Carl and Barney were tormented by a clown that lived in the sewer. Together they defeated the face-painted fiend. Now as adults, they are about to be tormented by the same clown again. Sometimes “IT Happens.” Then, Comic Book Guy gets a well-deserved curse placed on him by an unsuspecting citizen of Springfield. And finally, Marge is the only one standing between her family and a fungal invasion from space!" Modified on September 26, 2017, at 15:29.